The Great Migration across Africa starts in northern Tanzania and moves northward across the Serengeti plains into southern Kenya. It’s a moving mass that can be seen from space, a grazing caravan of over 2 million wildebeest, zebras, gazelles, and other wild fauna, following the water and the land, avoiding predators, maintaining ecosystems, and providing a dynamic natural wonder difficult to match. My own African migration started with a flight from Morocco to Dar es Salaam, Tanzania and on to Zanzibar. That began a solo voyage across the African continent fraught with sketchy airport Burger Kings and menacing taxi drivers waiting to pounce. Making my way north from Zanzibar in a disconcertingly small single-propellor plane, we landed in Arusha, Tanzania’s urban gateway to safari land. I was to be an ecotourist. A (very relatively) wealthy Westerner coming to Africa with disposable dollars, hoping to see the wonders of the wild without getting too wild myself. And that is exactly what I got: a perfect mix of untouched nature and managed experience. From the moment we arrived in Tarangire National Park the rangers and guides from the various safari tour companies emitted an air of welcoming seriousness. When one of my safari companions gently honked the horn of our 4-wheel truck while taking some fun tourist photos at a bathroom stop, a park ranger soon solemnly appeared and requested she “come with me please.” Even though we were still outside the park entrance and away from any wildlife, she was threatened with a fine. They meant business. And that business was the animals. A safari is an exercise in patience, and in sitting. Lots of sitting. Rolling along the dirt roads you sit and watch humble urban outskirts become sparse red-earthed countryside, your body endlessly vibrating along with your beat-up Toyota Land Cruiser as it rumbles off the main roads and into the parks, the sun and the dirt creeping in from everywhere. 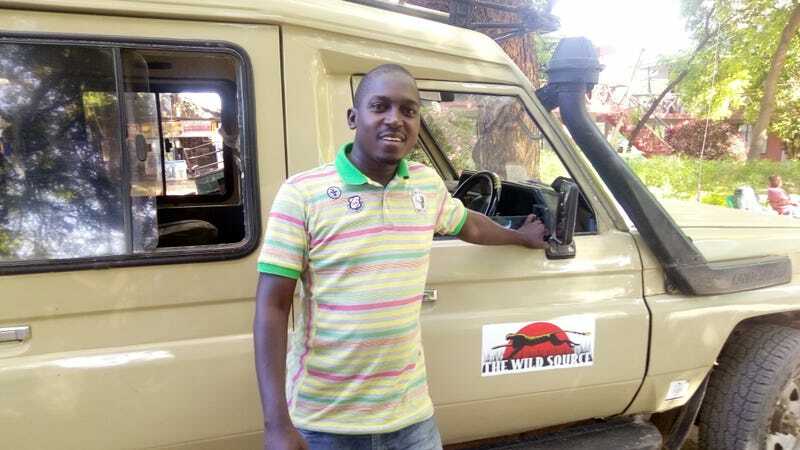 I lean in from my seat and into the front cabin to chat with Erick Chima, our guide and driver for this safari to Tarangire and the Ngorongoro Conservation Area, the two neighbouring national parks that border the Serengeti and where parts of the great migration begin. Chima is from Kibosho, a small town in northern Tanzania. He began working as a porter, carrying bags and gear for tourist climbers going up Mount Kilimanjaro. For years, he saved his tips and was able to put himself through a two-year college for safari guides. Now he is certified and has moved up the ecotourism ladder. “Being a porter let me go to guide college and now my salary is higher. I can send some back to my family,” Chima said. In developing nations, foreign financial investment can often pool inequitably at the top, clogged by corruption or cronyism. However, the economic benefits of ecotourism seem to get dispersed much more evenly, filtering down to the general population in more democratic ways. Personally, I saw our safari dollars spread across many local hands, from the driver in Arusha town to the small booking agencies that organized the excursion and, of course, to the national parks and all their related services. Driving along the road, passing Maasai tribesman wearing dark red tunics and carrying their traditional spears and walking sticks, Erick, a man of few words, described how tourist money supported many locals, from the hard-working porters to the surrounding farmers and markets that supply the daily food for our treks. “It spreads and helps in many ways” Erick concluded, shifting his attention back to the road. I ended the exchange with a slightly facile metaphor about rain washing down and watering the surroundings. He nodded and kind of cracked a smiled. National parks like these are the new darlings of wildlife conservation. A long history of unregulated hunting and poaching has decimated animal populations, with many of our planet’s most spectacular creatures becoming critically endangered or even wiped out completely. The recent Great Elephant Census (GEC) is the most extensive survey ever completed on elephant populations. From hard population data to migration patterns that allow governments to better allocate park resources, over two years this team of 90 plus researchers compiled voluminous amounts of aerial data, flying over 460,000 km across 18 countries. There were many troubling findings, like how 30% of African elephants have been lost in just 7 years due to increased poaching. And one of the more surprising figures was an unbelievable 53 percent drop in the elephant population in Tanzania from an estimated 109,000 in 2009 to 51,000 in 2015. This was terrible news for wildlife conservationists and for a Tanzanian government that depends highly on safari tourism. Since the report, they have increased funds by 40% to one park and added 300 rangers to others. These figures show that despite conservation efforts, the unfortunate historic trend is continuing. But it also shows that money talks. The terrible losses in Tanzania took place mainly in the south, where there are lots of elephants but way fewer tourists. The famous northern parks like Ngorongoro and Serengeti get more safari visitors, and therefore more dollars. Each safari visitor must pay a hefty park entrance fee, so more tourists equals more money, which then equals more resources for rangers and other conservation measures. It seems the battle for wildlife conservation, as with most things, will come down to dollars. Poachers kill illegally because there is money to be made from ivory and other big-game items. And well-intentioned hunters must often turn to poaching when governments start regulating the animals and land they used to depend on to survive. By protecting wildlife, you choke off access to the natural assets and money-making opportunities of often impoverished communities. Blunt and blind regulation simply pushes more people into illegal activities like poaching, so it’s paramount to find an integrated method of conservation, one that not only preserves nature but also offers financial alternatives to local residents. The paradoxical reality of increased tourist dollars and increased poaching shows that doing one without the other dooms the whole endeavor. There are examples of how this could work. Botswana seems to be a leader in integrating conservation and local economic development. Besides banning commercial hunting, the Botswana government has implemented a lower-volume, high-cost approach to ecotourism, and included rural communities in land-licensing so they more directly benefit from tourism dollars and thus feel less pressure to rely on illegal trades like poaching. Botswana now has the highest number of elephants on the continent and one of the lowest rates of poaching. And there is Uganda, which, thanks to stable and growing wildlife tourism mixed with stricter poaching penalties, has seen increases in many of its major animal populations. And figures from the Great Elephant Survey confirm that Uganda now has 600% more elephants than in the 1980s. According to this paper published by the David Sheldrick Wildlife Trust, an elephant killed for its ivory can bring in about $21,000 in illicit sales but is worth over $1.6 million in tourism dollars if brought into a well-managed ecotourism sector. This is an example of how much potential there is in this industry and how much economic benefit is waiting for local communities if governments and businesses and NGOs can come together to make sure local players are properly brought into the mix. This piece in the Guardian by Will Jones, a fellow at the National Geographic Society, takes a look at the different approaches to conservation and highlights regions and organizations going a step further than the enclosed or “fortress” national park model and adopting a truly integrative, and potentially more sustainable, approach that more organically blends people and animals and the land together. This is a complex and dynamic issue, a real-life moving thing that changes with the weather, with the water, with the pressures that individuals on the ground—both animals and humans— feel to survive and thrive. By researching where you go and who you give your money to, you can directly inject financial support to deserving causes, helping natural habitats and their surrounding residents. Ecotourism dollars help reward good actors and highlight models that work, pushing others to follow their lead and move in more positive directions. Going on a safari is more than just a holiday. It is, like other ecotourism options, an opportunity to not only see natural wonders but help make sure they stick around.